"Right sir, leave everything to me." The above info came from Jane Sella, and was edited by yours truly (contact me). Norman is a very loyal butler for Roger Smith. Norman has a patch over his left eye and follows the rules diligently. He wears black just as Roger instructs without a word. Norman also performs a very important duty. He fixes Big-O and works on him with a group of unknown men. This butler is also always prepared for the worst. He has an awesome motorcycle that has bullets and everything. Norman works very hard to please "Master Roger". He cooks, cleans, and all of the general household duties. He proves to be a loyal butler and a worthy friend. The above description came from Jane Sella, and was edited by yours truly (contact me). 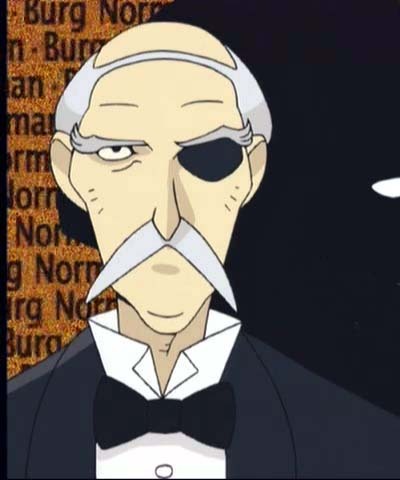 Norman Burg is the typical butler you would expect a rich man to have, or in this case, one you would expect a super hero to have. He is of relatively old age, very tall and well kept, always having impeccable manners and carrying himself with a very dignified air about him. He is a very interesting character, an unknown air about him. He can cook, clean, repair cars, repair Big-O, repair electronics, guard the house, perform rescue missions, and that's just naming a few of his many abilities. According to the story, he was the Butler for the house that existed there since the great amnesia. Even though he worked there alone with no master, he did not seem to mind. Once Roger showed up, he declared him the master of the manor, of his services, and of Big-O, which had been in the underground base area of the house since before the amnesia attack. Norman could not explain why, but he just knew when Roger arrived, that he had to serve him. Roger agrees, and becomes the Domineus (Pilot) of the Megadeus. He does extremely well as a Butler, doing commands to the letter and never failing to aid Roger whenever he can. He was more then happy to accept Dorothy as his assistant, not that he needed someone but thankful to have someone there to keep him company while he worked on his various tasks. It is unknown why even by him, but he is the only one capable of completely repairing Big-O, though he has been known to enlist help from others, a select few who mingle around as homeless people around the house until they are called upon. He never refuses orders and never disagrees with Roger, only once having ever made even the slightest of remarks (Roger asked once after agitating Dorothy if she was upset by something he said, and he replied; "No sir, nothing other then the usual sir."). Side Notes: Norman does not normally drive, but when he has to get around, he uses a specially converted WW1 motorbike with a sidecar. It is modified to be extra durable, extra fast, and has weapons such as a multi-pod rocket launcher. It is not known, but it can be guessed that Norman was the one who designed and built Roger's car along with all of it's various gadgets. He may have once been in the military, as shown when in various cases Roger needed help or rescue, he donned himself in military garb, complete with helmet and supply pack (once he dressed as a British WW1 soldier, in another case as a German soldier from the same war). He might have some Military training, on several occasions he has produced a very large, belt fed 50 .cal machine gun and operated it with professional skill. The above description came from Kefka, and was edited by yours truly (contact me).